When Brittany Marta graduated from college in May 2010, she owed $50,000 to the University of Missouri. Now a stay-at-home mom, Marta said she has not used her art history undergraduate degree for a specific job, but she does not regret her education. Marta believes education is not just about getting a job, but becoming a better person intellectually. American college students currently hold nearly $1 trillion in student loan debt. The Institute for College Access and Success reports that two-thirds of 2011 college seniors graduated with student loan debt, with approximately $26,600 per borrower. Despite the debt, a Pew Research study reports 86 percent of college graduates say college was a good investment. According to a 2007 College Board study, college graduates earn approximately $20,000 more per year than those who hold just a high school diploma. 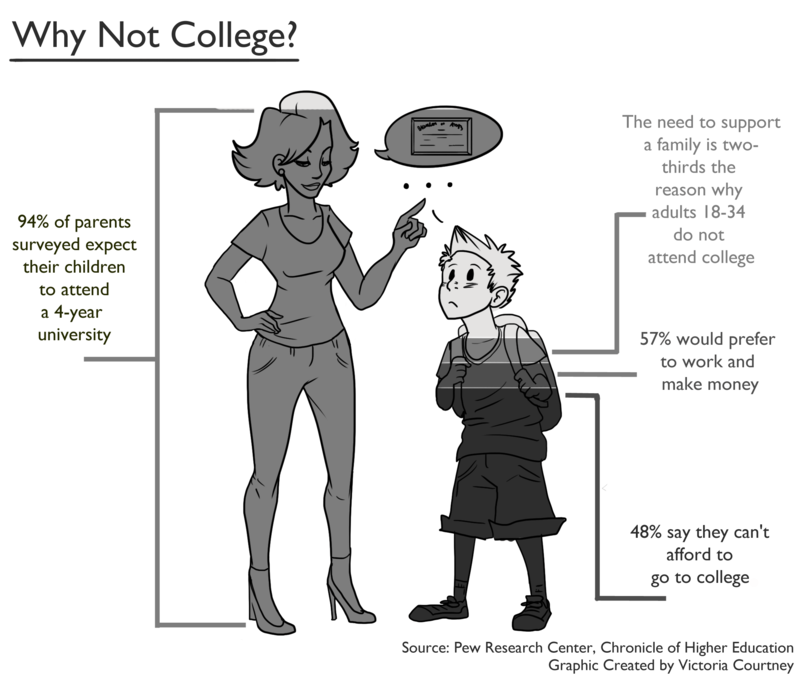 The study also reports college graduates are more likely to receive employer-provided benefits. Zach Brengard, a former Webster University student, was pursuing a Bachelor of Fine Arts in painting at Webster. But Brengard decided to leave Webster in 2010 when a job opportunity in tattooing became available. “Once I had an opportunity to do what I had planned to do when I graduated, I figured I’d might as well take it,” Brengard said. Brengard works in Las Vegas as a tattoo artist and is happy with his decision to leave school. He said he enjoyed his time at Webster, but felt his job experience has been just as beneficial in his development as an artist. Peter Thiel, co-founder of PayPal, a system that allows money to be transferred via the Internet, and billionaire venture capitalist, said he believes there are times when college is not always necessary. In a May 2012 “60 Minutes” interview with Morley Safer, Thiel said if a person wishes to pursue a career which requires a specific credential, then college is required. But if training or accreditation is not necessary for employment, students should think hard about whether college is worth the investment. “We have a society where successful people are encouraged to go to college. But it’s a mistake to think that that’s what makes people successful,” Thiel said. Tracy Johnson, owner of SweetTpieS Dessert Studio in Festus, graduated from Jefferson College in 1991. She said her business degree helped with the accounting aspect of her own business. Johnson also said her experience as a real estate agent and her work in retail prepared her more than her degree. Johnson said she believes the best training for an entrepreneur is to shadow a professional in the field. “Shadow someone successful with a proven track record — especially in the field you are looking for,” Johnson said. There are several nontraditional options besides a four-year degree. Technical schools provide specialized job training with competitive wages. According to Ranken Technical College salary information, the average yearly wage for a graduate with three to four years of experience is $40,000 to $60,000. Ranken Technical College President Stan Shoun said despite the country’s economic troubles, graduates are able to find jobs in their chosen career fields. “In some areas such as machining, the demand is greater than the number of graduates,” wrote Shoun in Ranken’s 2012 fiscal report. Nick Fowler graduated from Linn State Technical College with an associate degree in applied science in powersports technology. He graduated with less than $15,000 in student loan debt. Fowler said he was able to use the Missouri A+ Program, which partly financed his college education. Fowler secured a job with Mungenast St. Louis Honda Motorsports before he graduated in 2009, but he was laid off within six months. Fowler was able to get work as a security guard after being laid off, but was disappointed he was not using his degree.